The Dutch brand Eminent adds Smart TV and Media Player functionality to your television with its WEB-TV Boxes. The EM8100 and EM8102 WEB-TV Boxes combine home cinema experience with Smart TV features. A Media Player functionality, online interactive media, on-demand streaming media and over 500 Internet TV & radio channels become one. 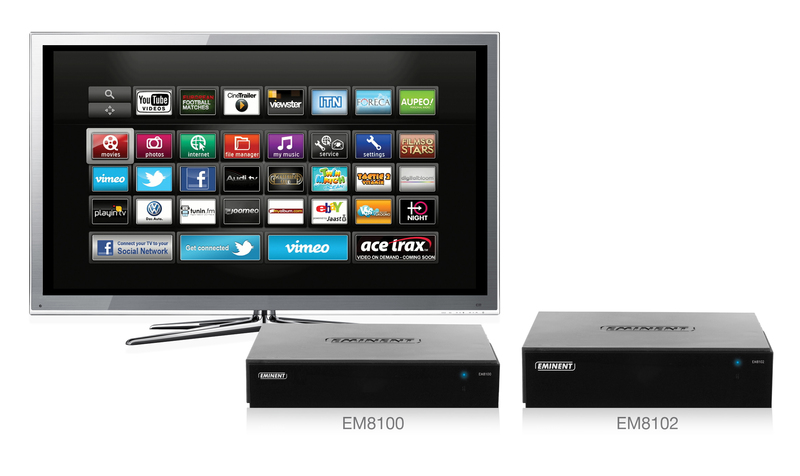 The Eminent WEB-TV Boxes are available from early 2012. As a manufacturer of Full HD Network Media Players Eminent offers functionality to display almost all video and audio formats on the television. The EM8100 & EM8102 WEB-TV Boxes supports almost all movies formats in Full HD 1080P on your television. The end-user has a wide range of online services available for television. These services are immediately available on the television and provide optimal television viewing with easy control. The WEB-TV Boxes are equipped with a web browser and full HD Media Player that supports displaying video and audio on the TV from any other device in your home network. With a wide range of services like Youtube, Facebook, Twitter, weather forecast, eBay, live music concerts and video-on-demand, there is something available for everybody. Even your favorite games like Connect 4, Solitaire and Sudoku can be played directly on your television. For the sports fanatics online services like football, rugby, cricket, tennis, winter sports and motorsports are available. As well as English content there is also German, French and many other global content available. Eminent launches two WEB-TV Boxes versions: the EM8100 WEB-TV Box and the EM8102 WEB-TV Box for internal hard disk. The EM8102 WEB-TV Box has extra features like the possibility to build in a hard disk, USB 3.0 port and Gigabit-LAN connection. Eminent is a leading HD Media Player brand in the Dutch market. Eminent offers its users five years warranty, easy installation and full support. The WEB-TV Boxes come with a multilingual user manual and all the necessary cables, including a HDMI cable. For more information visit EM8100 and EM8102. Note for the editor: A variety of other pictures are available. For more information and sample requests please address to Communications, by phone +31 (0) 46 478 93 92 or communications@eminent-online.com. This press release was distributed by ResponseSource Press Release Wire on behalf of Eminent Europe in the following categories: Men's Interest, Consumer Technology, Computing & Telecoms, for more information visit https://pressreleasewire.responsesource.com/about.